Marge Simpson thinks potatoes are neat. And so do I, apparently, because this is my seventh post about potatoes. I’ve written posts for last year’s October Potato Day, August Potato Day, Potato Chip Day, Potato Lover’s Day, and two potato posts for Thanksgiving. Read ’em all! However, I’ve never made a kid take a potato to school for Show & Tell, like Marge does in the clip below. For me, this is a memorable bit of characterization, because it says so much about Marge that she would find satisfaction in a potato. 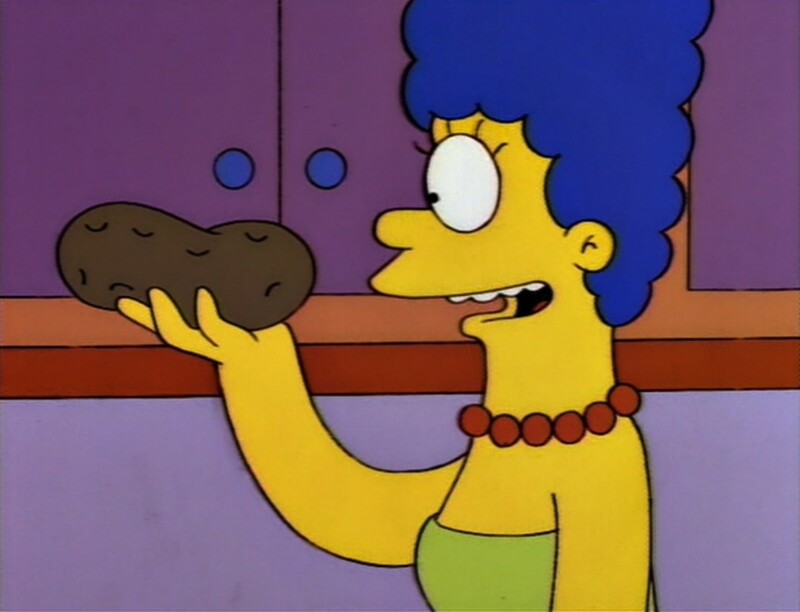 MARGE: Why don’t you bring this potato [for Show & Tell]? It’s pretty big! BART: Mom, you’re always trying to give me potatoes. What is it with you? MARGE: I just think they’re neat.